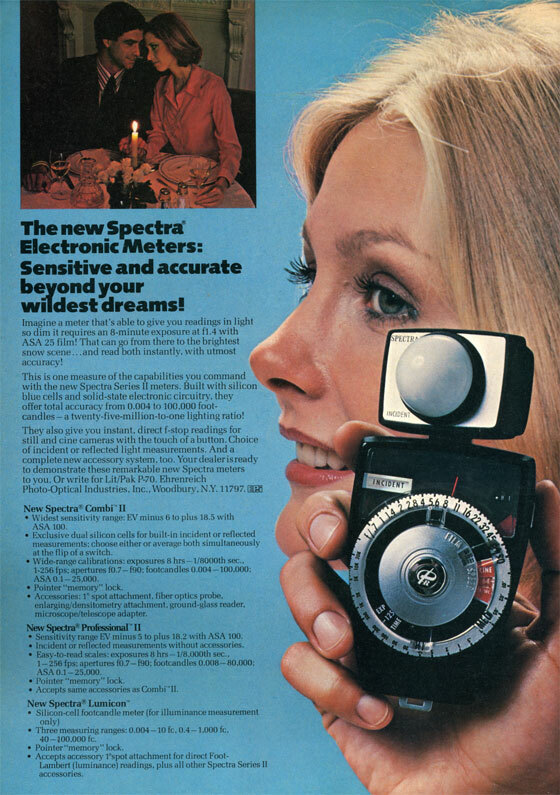 A modern updating of the venerable Spectra Combi-500, but with several important differences. The Combi-500 had two sensors, one CdS and one Selenium, sharing the same area on the rotating head, and the calculator dial was on the back of the head and a footcandle meter was on the base. On this machine, the calculator dial has been moved to the base. The head still has two sensors but they are located opposite each other: one is for reflected light and the other for incident. The CdS/Seleniums have been replaced with two Silicon cells, and they run off a PX-28 battery which you can still get (my Canon AE-1 runs off a PX-28). The Photodisc/Photosphere have been retained, but they're now bayonet mount, and the unit will take a bunch of nice accessories. The base has also been tapered a bit and the head finessed. It looks much more modern than it's 1945-designed predecessor. Oddly, this makeover makes it look a bit more like its cousin, the Sekonic L-28. It's very likely this update was made to bring the meter up to compete directly against the better Sekonics and the Gossen Luna Pro series. 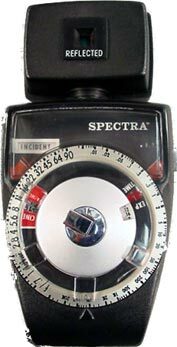 The latter, in particular, was a system meter that accepted a range of accessories. Mine came with the 1° spot attachment, called a Photospot which is (of course) broken. You can also get attachments for a flexible probe, a ground-glass reader, an enlarger spot, and a couple of other things.